Shanna is a great person. I recommend to work with her, has incredible customer service. Everything was perfect, staff members are great persons and work excellent, including the cleaning lady has a smile on her face. Internet Service failed but I believe it had something to do with the reception carrier. 5 Star Home. RESPONSE: Thank you very much, we are happy you enjoyed your stay with us and hope to have you back soon. The staff was quick to respond to issues - we had some problems with the hot tub, internet and water pressure. They were quick to come to the property and handle it. This house had it all. It was fully stocked in the kitchen and had a great washer/dryer. The maintenance worker and his family do live under the property but he was beyond friendly and a hard worker and it was actually nice when we did have an issue that he was there to immediately address it. The view was just incredible! The house was clean and well air conditioned. You are very close to everything and the private beach was a great addition that is only about 2 houses over. It really was the perfect trip!! REPLY: We are so happy you found the house and staff to your liking, please come back and see us! We first got to Cabana Lana we were in shock. No photo could ever describe it. It was a definite have to see for your own eyes how nice our home for two weeks was. It was perfect and satisfying all of our needs as for privacy, it was clean, beautiful garden. We are able to cook in a full size kitchen and it was safe and very comfortable. After spending several days of touring the island, it is no surprise that Cabana Lana is the best choice. Best beach, best view, best cabin. wonderful job of landscaping. Thanks again for all the help and advice. A little advice from two weeks experience would be to put on some bug repellent asap. The bugs arent that bad, but it will save a lot of scratching. We are thinking of returning to Cabana Lana next year for a little more relaxing time on the best beach on Roatan. Its been two weeks and is time for us to leave. Im truly going to miss Cabana Lana. My ocean front property, my million dollar view of Roatan. The staff is very friendly, helpful and knowledgable. They always make me feel very welcome and like a member of the family. Theresa does a great job cleaning the Casa and is super sweet as well. I'm always so comfortable and happy staying at Casa Varadero that no matter how long I stay it's always quite difficult to leave. It is truly my dream home away from home and my favorite vacation house. I love the island of Roatan, the people of Roatan, and the diving in Roatan. Seems like magic happens everyday while I'm there. The location of my casa couldn't be any better as I can see the dive boat from the balcony. Also it's very close to the Farmacia and the best baleada place. The view from the kitchen and living room/dining room & balcony is spectacular and I never get tired of gazing out at the pristine waters of West Bay. Even my friends who live on the island love my view. Roatan has the best mangoes, pineapple, cashews, coconut, watermelon, limes & avocados too... REPLY: We LOVE having you as our guest! Thank you for your patience this past visit with the internet. We now have HIGH SPEED internet, you will be happy on your next visit with us. See you soon. The employees couldn't have been nicer! They answered any questions we may have had quickly and made our stay very enjoyable. Barefoot Dream Lower Level was amazing! 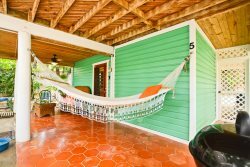 It was clean, perfect location to the beach and the front porch with the hammock was ideal for relaxing! REPLY: We are happy you enjoyed yourselves, please come back and visit us again soon! The Island House staff was very gracious and helpful. We had two families on the trip. My brother, his wife , and their two year old daughter stayed in the lower apartment. They were very happy they did and so were we. Ellie could get her regular nap and go to bed at her regular time and we didn't have to wake up at 5 AM with them. However, We also enjoyed our time upstairs together in the main house. All in all there were six of us and we all can't wait to go back to this house together. REPLY: Thank you very much, we are happy you all enjoyed yourselves! We were a large group of 10 people and had a few changes during the coordination process, the staff made any and all changeswithout problems. Very friendly and knowledgeable. The proper was clean, spacious and furnished great. Wonderful house. I myself would not want the grounds keeper . As i felt this a bit obtrusive to our stay . And as they were aleays visible and on the dock and if it were my home . This would be unnaceptable .. RESPONSE: Thank you for this, we will try and get him to be a little more out of sight in the future. Hope to see you back soon! Island House Roatan is fantastic to work with. The web site is very easy to use to book a location and the team members are very responsive through email or phone calls. As a rental owner myself there's always little issues here and there and the Island House folks take care of it quickly. We love the property. We've stayed in Varadero two trips in a row now. Can't beat the location. There were great places to eat within short walking distances along with some shops. West Bay beach is gorgeous. One of my favorite vacation spots by far. Everyone was VERY friendly and accommodating! The property was beautiful with amazing views. The pool deck is a great social place to hang out and the media room was a great getaway. AppleTV was a great additive to winding down the day. Thank you for your review. We are happy you enjoyed Shalymar and hope you can return to stay with us soon!